Lake effect snow is something everyone has heard mentioned at one time or another, but this phenomenon is rarely explained in detail. Oftentimes, the furthest explanation that is given is that cold air is blowing over the lake, resulting in some heavy snows. This description just scratches the surface of what needs to happen for lake effect snow to occur. Let's dig into the science behind lake effect snow, who gets the most, and what ingredients need to come together for any sort of lake effect snow event to occur. Lake effect snow will only occur when there is a large enough difference between the cold air blowing over the lake and the surface water temperatures that are present in the lake. When the temperature between these two variables is 13 degrees celcius or greater, lake effect snow is possible. When this temperature difference occurs, the lakes essentially act like boiling pots of water as steam can oftentimes be seen rising out of the lake. These clouds of steam are the first step in the production of lake effect snow. 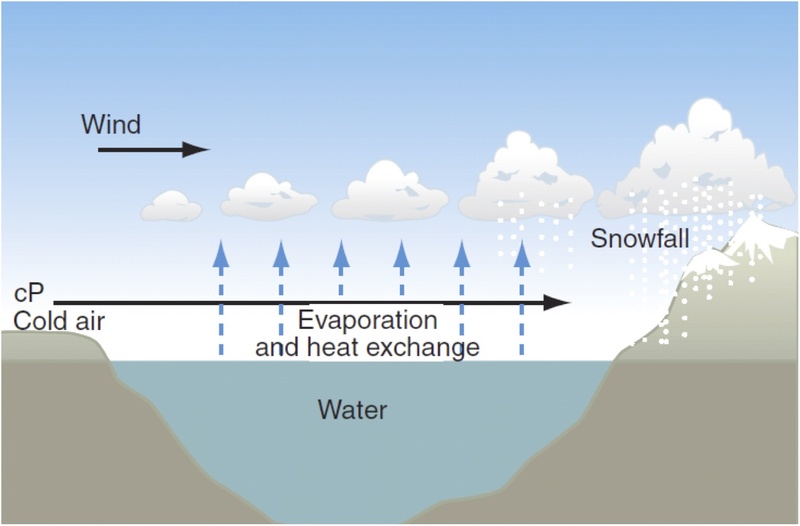 The greater the temperature difference is between the water and the cold air aloft, the larger the amount of moisture is that rises into the atmosphere. The next important aspect to look at when diagnosing lake effect snow events is looking at the amount of fetch that will occur over various parts of the lake. Fetch is a term that describes the distance that wind travels across open water. The longer the distance that the wind travels over open water, the greater the fetch. Greater fetch results in an increasingly moist air mass, which makes it a major deciding factor in where lake effect snow bands set up. Fetch typically needs to be 60 miles or greater in order for significant lake effect snow to occur. The shape of each great lake determines what wind directions will offer the greatest fetch. For Lake Superior, the greatest fetch occurs with a northwesterly wind. This allows the cold air to travel across the greatest distance of open water. Towns such as Ironwood, Houghton, and Munising are all beneficiaries of lake effect snows when bitter cold air masses travel from the northwest to the southeast across the lake. Because the predominant wind direction is from the northwest during cold snaps, snow piles up the greatest for these areas as well. The map below depicts the areas which see the most lake effect snow each season, these regions are often referred to as snowbelts. Most of the snowbelts over the western great lakes are driven by the predominant northwest winds that usher arctic air masses in each winter. However, lakes Erie and Ontario behave differently due to their unique shape. When arctic air masses blow in from the west to southwest, the most intense lake effect snows will occur across these eastern lakes. This is why Buffalo and Watertown, New York can see some of the heaviest lake effect snows during favorable weather patterns. In addition to the amount of fetch and the temperature difference between the lake and the arctic air blowing over it, a few other factors will dictate how heavy or light a lake effect snow event will be. One such factor is the topography of the land. When the winds blow across the lake and eventually reach land, the friction over the land slows down the wind and acts to pile up the moisture that has been collected over the lake, which results in precipitation. If the elevation of the land increases as the winds blow inland, this acts to squeeze out even more moisture. This is because as the air is forced upwards, the air cools further and becomes increasingly moist, resulting in greater amounts of lake effect snow for higher elevation areas. Another factor that can impact the severity of a lake effect snow event is concerning how moist the arctic air mass is before it starts to blow over the lake. Most arctic air masses are inherently dry, but some will have more moisture than others. When the air is more moist before it blows over the lake, it will have the ability to become impressively moist by the time it reaches the other end of the lake. Ice concentration on the lake can also have major impacts on the ability for substantial lake effect snows to occur. Ice cover eliminates the ability for moisture to be picked up into the clouds and deposited as lake effect snow. Even partial ice cover will hinder lake effect snow development, as the fetch will decrease as more ice forms. During winters when the lake stays fairly open, lake effect snows will be possible during the entire season. A winter that experiences a period of heavy ice cover will see the ability for lake effect snows end until the lake begins to open back up. The image above shows the average annual snowfall across the Great Lakes. Notice the higher snowfall averages on the southeast shores of Lake Superior and Michigan. There areas see greatest amount of lake effect snow each year due to the predominant northwesterly winds that occur when arctic air masses build across the region. The snowiest town east of the Mississippi river is the town of Houghton, MI, located in the Keewanaw Peninsula. Annually, Houghton receives an average of 208 inches of snow. The snowiest year on record for residents occurred back in the winter of 1978-79. During this epic winter, the city received nearly 356 inches of snow. Hard to believe any town could find enough places to put that much snow! The heaviest lake effect snow event on record goes to an area of upstate New York called the Montague Township in the Tug Hill Plateau region. This area picked up a whopping 40 inches in just 12 hours while in the middle of a 3 day lake effect snow event that began on January 11th, 1997. A storm total of 95 inches was realized by the end of this epic lake effect snow event. Although lake effect snows can be extremely heavy, they also tend to be extremely localized as well. It is common for snow amounts to vary from a few inches to a few feet in just a matter of a few miles. This makes predicting lake effect snowfall amounts exceptionally difficult. But by diagnosing predicted wind directions, lake to air temperature differences, and looking at regional topography, meteorologists can give their best estimate as where and how much snow will pile up during each event.